Northeastern Naturalist Vol. 23, No. 2 J. Fowler 2016 305 2016 NORTHEASTERN NATURALIST 23(2):305–320 Specialist Bees of the Northeast: Host Plants and Habitat Conservation Jarrod Fowler* Abstract - Habitat conservation is performed in North America to support populations of managed and wild pollinators. The current recommended plant selections for northeastern pollinator habitats primarily provide resources for common or generalist pollinators. However, such plants may not benefit uncommon or rare northeastern specialist pollinators, whose populations are susceptible to harm from anthropogenic threats. This manuscript presents the first catalog of native specialist bees and associated host plants for the Northeast. Approximately 15% of northeastern native bee species are pollen specialists, represented by 6 families, 15 genera, and 61 species of bees that restrict pollen foraging to 23 families, 33 genera, and 201 possible species of native host plants. Specialist bees are associated with non-graminoid forbs and non-coniferous woody plants in nearly all major northeastern terrestrial and wetland habitats. Herein, I identify and discuss vulnerable bee– plant associations and suggest greater emphasis on research and restoration efforts. I recommend that northeastern pollinator-conservation practice specifically target specialist bees. Introduction Recently documented declines in pollinator populations threaten the resilience of ecosystems, societies, and economies (Cameron et al. 2010, Kennedy et al. 2013, Olroyd 2007). Pollinator-population declines can be slowed through habitat conservation (Mader and the Xerces Society 2011, Mader et al. 2010). As defined by the US Department of Agriculture Natural Resources Conservation Service (USDANRCS 2012), pollinator habitat conservation practices “address the improvement, restoration, enhancement, or expansion of flower-rich environments, which support populations of native and/or managed pollinators.” Conservation practices, including cover crops, field borders, and hedgerows increase local-scale annual and perennial floral abundance and diversity to offer resources, habitat, and refugia for pollinator populations (Xerces Society 2014). Pollinator conservation improves pollination services for agro-ecosystems and provides benefits to other ecosystem services (Isaacs et al. 2009, USDA-NRCS 2009, Vaughan et al. 2012, Wratten et al. 2012). Current lists of suggested plants for pollinator habitat conservation in the northeastern US are often composed of long-blooming, non-seasonal species that are sometimes not indigenous to the region (Garbuzov and Ratnieks 2014). These broadly attractive plants are readily available commercially, are relatively inexpensive, and largely serve to sustain generalist pollinators of crops, including Apis mellifera L. (Western Honey Bee) and the community of native and non-native bees that are colonial, eusocial, or have multiple broods per year. Pollen-generalist *The Xerces Society for Invertebrate Conservation, Portland, OR; Corresponding author - jarrod@xerces.org. Manuscript Editor: Joshua Nees Northeastern Naturalist 306 J. Fowler 2016 Vol. 23, No. 2 bees (polyleges) may forage unrelated plants and casually or regularly exhibit flower constancy, but are not limited by particular pollen sources (Hurd et al. 1980). Although pollen is the primary nutritional source for bee populations, not all pollen is accessible or nutritionally suitable (Cane and Sipes 2006). Flowering phenology, visual and olfactory cues, floral and pollen morphology, and nutritional values (amino acids, lipids, proteins, secondary metabolites, starches, and sterols) vary across and within plant species, setting stages for distinct pollen associations and preferences (Behmer and Nes 2003, Roulston et al. 2000). Pollen can be physiologically indigestible or may be physically or temporally unavailable for foraging by many native specialist-bee species. Therefore, the overall bee biodiversity in the Northeast may not be augmented by current standard plantings (Kleijn et al. 2015, Praz et al. 2008, Roulston and Cane 2000, Senapathi et al. 2015). Northeastern native pollen-specialist bees (oligoleges) evolved a continuum of secondary facultative or primary obligate associations with flowering host plants (Cane and Sipes 2006, Hurd et al. 1980, Linsley and MacSwain 1956, Robertson 1925). Oligoleges associate with one host-plant family or a few related genera or species; monoleges specifically associate with a single host-plant genus or species (Cane and Sipes 2006, Robertson 1925). Such associations can benefit both bee and flower by improving foraging effectiveness and efficiency, pollen digestibility, and pollination rates. However, restricted associations can be susceptible to harm due to habitat degradation, fragmentation, and loss, or phenological mismatch (Bartomeus et al. 2013, Minckley et al. 1994, Rafferty et al. 2015). Consequently, anthropogenic threats in the Northeast potentially threaten native specialist-bee species and their endemic, indigenous host-plant species with population declines and extinctions through loss of plant diversity (Gavier-Pizarro et al. 2010, New England Wild Flower Society 2015a, Radeloff 2005). Pollen associations and preferences for many northeastern native specialist bees can be derived from published and unpublished field observations and specimen records (Lovell 1918; Mitchell 1960, 1962; Robertson 1926, 1929). Here, I organize bee–plant observations and records to catalog northeastern native host-plants for native specialist bees. This catalog provides opportunities to augment current lists of plant selections for pollinator-habitat conservation and enhancement with recommended host plants for specialist bees. Such recommendations can be integrated into pollinator-habitat management practices, and are broadly relevant for the Northeast and the adjacent regions in Canada. Study-system Description This research includes pollination records from the northeastern US, including 6 states: Connecticut, Maine, Massachusetts, New Hampshire, Rhode Island, and Vermont. The Northeast is an ecologically diverse region within the temperate broadleaf and mixed forest biome that belongs to the North American Atlantic Geobotanical Region. This geo-botanical region is composed of 2 floristic provinces, the Appalachian Province and Coastal Plains Province, with 1 floristic tension zone (Kartesz 2013). The northeastern northern forests and eastern temperate forests are Northeastern Naturalist Vol. 23, No. 2 J. Fowler 2016 307 comprised of Atlantic Highlands, Mixed Wood Plains, and Mississippi Alluvial and Southeast USA Coastal Plains, which are further comprised of diverse microhabitats, such as Northern Highlands, Northeastern Coastal Zones, Acadian Plains and Hills, Eastern Great Lakes Lowlands, and Atlantic Coastal Pine Barrens (Griffith et al. 2009; Omernick 1987, 2004). Overall, humid cold-temperate and warm continental climates with 71–200 cm of precipitation per year, average growing-season temperatures of 12–21 ºC, average annual extreme minimum temperatures of -40 ºC to -15 ºC, and relatively moist yet well-drained, acidic to neutral upland silts/loams foster species-dense and species-rich communities of native, endemic, exotic, and hybrid terrestrial, wetland, and aquatic plant species (USDA-NRCS 2014). Methods For this study, I define specialist bees as those that restrict their pollen foraging to only 1 host-plant family (Cane and Sipes 2006, Robertson 1925). In reality, most specialist-bee records are associated with 1 host-plant genus or species. We defined northeastern natives as specialist bees that are indigenous to Connecticut, Massachusetts, Maine, New Hampshire, Rhode Island, or Vermont without human intervention. I used online sources (Ascher and Pickering 2014; Hilty 2012), peer-reviewed articles (Robertson 1926, 1929), technical bulletins (Mitchell 1960, 1962), and personal communications with contemporary bee researchers to compile specimen records of ~400 species of native bees captured or observed on flowers of host-plants. In addition to data on host-plant associations for each bee species, I collected information concerning conservation status, habitat, native range, nesting organization, monthly phenology, number of records per state, and taxonomy. I included pollen-carrying native bees but not cleptoparasitic bees in this study. I compared bee-plant records with county-level northeastern plant distributions from online (New England Wild Flower Society 2015b) and print sources (Haines et al. 2011). According to plant-distribution source definitions, native species are indigenous and non-native species are either intentionally or unintentionally introduced species that have become naturalized; present species are those that have been documented by herbarium specimens or photographs in a particular county, and undocumented species are those that have never been documented in a particular county but may be present or restricted to certain habitats within that county (New England Wild Flower Society 2016). This study considered only host-plant species that are native and documented as present in at least 1 county of 1 of the 6 northeastern states: Connecticut, Maine, Massachusetts, New Hampshire, Rhode Island, or Vermont. I included records of specialist-bee species collected from northeastern native plant genera or species, even if those collections came from outside the region. I compiled information concerning plant taxonomy, morphological groups, indigenous and introduced ranges, habitat types/growing conditions, and habitat-keyword descriptions of each possible host-plant species. As above, I analyzed and summarized the data for targeted specialist-bee conservation and management in the northeast and nearby regions. Northeastern Naturalist 308 J. Fowler 2016 Vol. 23, No. 2 I compared specialist-bee and possible host-plant data to determine if values of plant groups and plant habitats change as products of associated bee richness. I assigned each host-plant species per plant genus to 1 of 5 plant groups (D = herbaceous, flowering dicot, M = herbaceous, flowering monocot, S = broad-leaved woody shrub, ST = broad-leaved, woody shrub/tree, and T = broad-leaved woody tree) and 5 plant habitats (A = aquatic, AW = aquatic wetlands, T = terrestrial, TW = terrestrial wetlands, and W = wetlands). In this study, the 5 plant habitats defined a continuum of host-plant growing conditions, from continuously submerged soil, to permanently or seasonally saturated soil, to arid upland soil. To express proportional importance of host-plant and specialist-bee associations according to plant-group and plant-habitat, I multiplied the number of host-plant species per genus according to plant group or plant habitat by the number of associated specialist bees. Results Approximately 15% of northeastern native bees were pollen specialists. I catalogued 6 families, 15 genera, and 61 species of northeastern native specialist-bees and 23 families, 33 genera, and 201 possible species of northeastern native hostplants (Table 1, 2). The host-plant genera that were associated with the greatest Table 1. Northeastern native specialist-bee families and species with associated host-plant families and genera. Bee families and member genera and species with associated host-plants are presented in ascending alphabetical order. [Continued on following page.] Bee family/bee scientific name Plant family Plant genus Andrenidae Andrena aliciae Robertson Asteraceae Helianthus Andrena arabis Robertson Brassicaceae Arabis Cardamine Andrena asteris Robertson Asteraceae Solidago Asteraceae Symphyotrichum Andrena bisalicis Viereck Salicaceae Salix Andrena braccata Viereck Asteraceae Euthamia Asteraceae Solidago Andrena bradleyi Viereck Ericaceae Gaylussacia Vaccinium Andrena canadensis Dalla Torre Asteraceae Solidago Andrena carolina Viereck Ericaceae Vaccinium Andrena clarkella (Kirby) Salicaceae Salix Andrena cornelli Viereck Ericaceae Rhododendron Andrena distans Provancher Geraniaceae Geranium Andrena erigeniae Robertson Portulacaeae Claytonia Andrena erythrogaster Ashmead Salicaceae Salix Andrena erythronii Robertson Liliaceae Erythronium Andrena fragilis Smith Cornaceae Cornus (Swida) Andrena frigida Smith Salicaceae Salix Andrena geranii Robertson Boraginaceae Hydrophyllum Andrena helianthi Robertson Asteraceae Helianthus Andrena hirticincta Provancher Asteraceae Euthamia Asteraceae Solidago Andrena illinoiensis Robertson Salicaceae Salix Northeastern Naturalist Vol. 23, No. 2 J. Fowler 2016 309 Table 1, continued. Bee family/bee scientific name Plant family Plant genus Andrena krigiana Robertson Asteraceae Krigia Andrena mariae Robertson Salicaceae Salix Andrena nigrae Robertson Salicaceae Salix Andrena nubecula Smith Asteraceae Solidago Asteraceae Symphyotrichum Andrena placata Mitchell Asteraceae Solidago Asteraceae Symphyotrichum Andrena platyparia Robertson Cornaceae Cornus (Swida) Andrena salictaria Robertson Salicaceae Salix Andrena sigmundi Cockerell Salicaceae Salix Andrena simplex Smith Asteraceae Solidago Asteraceae Symphyotrichum Andrena uvulariae Mitchell Colchicaceae Uvularia Andrena violae Robertson Violaceae Viola Andrena ziziae Robertson Apiaceae Zizia Calliopsis nebraskensis Crawford Verbenaceae Verbena Panurginus potentillae (Crawford) Rosaceae Potentilla Perdita halictoides Smith Solanaceae Physalis Perdita octomaculata (Say) Asteraceae Solidago Pseudopanurgus nebrascensis Crawford Asteraceae Solidago Asteraceae Symphyotrichum Pseudopanurgus pauper (Cresson) Rhamnaceae Ceanothus Apidae Habropoda laboriosa (Fabricius) Ericaceae Vaccinium Melissodes agilis Cresson Asteraceae Helianthus Melissodes apicata Lovell and Cockerell Pontederiaceae Pontederia Melissodes denticulata Smith Asteraceae Vernonia Melissodes desponsa Smith Asteraceae Cirsium Ptilothrix bombiformis (Cresson) Malvaceae Hibiscus Colletidae Colletes aestivalis Patton Saxifragaceae Heuchera Colletes banksi Swenk Aquifoliaceae Ilex Colletes latitarsis Robertson Solanaceae Physalis Colletes productus Robertson Ericaceae Lyonia Colletes simulans Cresson Asteraceae Euthamia Asteraceae Solidago Asteraceae Symphyotrichum Colletes solidaginis Swenk Asteraceae Solidago Halictidae Dufourea monardae (Viereck) Lamiaceae Monarda Dufourea novaeangliae (Robertson) Pontederiaceae Pontederia Lasioglossum oenotherae (Stevens) Onagraceae Oenothera Lasioglossum pectinatum (Robertson) Solanaceae Physalis Megachilidae Megachile oenotherae (Mitchell) Onagraceae Oenothera Osmia virga Sandhouse Ericaceae Vaccinium Melittidae Macropis ciliata Patton Myrsinaceae Lysimachia Macropis nuda (Provancher) Myrsinaceae Lysimachia Macropis patellata Patton Myrsinaceae Lysimachia Melitta americana (Smith) Ericaceae Vaccinium Melitta melittoides (Viereck) Ericaceae Lyonia Northeastern Naturalist 310 J. Fowler 2016 Vol. 23, No. 2 Table 2. Northeastern native plant families and genera with hosted bee families and species. Plant families and member genera with hosted bees are presented in ascending alphabetical order. [Continued on following page.] Plant family Plant genus Bee family Bee scientific name Apiaceae Zizia Andrenidae Andrena ziziae Aquifoliaceae Ilex Colletidae Colletes banksi Asteraceae Cirsium Apidae Melissodes desponsa Asteraceae Euthamia Andrenidae Andrena braccata Andrenidae Andrena hirticincta Colletidae Colletes simulans Asteraceae Helianthus Andrenidae Andrena aliciae Andrenidae Andrena helianthi Apidae Melissodes agilis Asteraceae Krigia Andrenidae Andrena krigiana Asteraceae Solidago Andrenidae Andrena asteris Andrenidae Andrena braccata Andrenidae Andrena canadensis Andrenidae Andrena hirticincta Andrenidae Andrena nubecula Andrenidae Andrena placata Andrenidae Andrena simplex Andrenidae Perdita octomaculata Andrenidae Pseudopanurgus nebrascensis Colletidae Colletes simulans Colletidae Colletes solidaginis Asteraceae Symphyotrichum Andrenidae Andrena asteris Andrenidae Andrena nubecula Andrenidae Andrena placata Andrenidae Andrena simplex Andrenidae Pseudopanurgus nebrascensis Colletidae Colletes simulans Asteraceae Vernonia Apidae Melissodes denticulata Boraginaceae Hydrophyllum Andrenidae Andrena geranii Brassicaceae Arabis Andrenidae Andrena arabis Brassicaceae Cardamine Andrenidae Andrena arabis Colchicaceae Uvularia Andrenidae Andrena uvulariae Cornaceae Cornus (Swida) Andrenidae Andrena fragilis Andrenidae Andrena platyparia Ericaceae Gaylussacia Andrenidae Andrena bradleyi Ericaceae Lyonia Colletidae Colletes productus Melittidae Melitta melittoides Ericaceae Rhododendron Andrenidae Andrena cornelli Ericaceae Vaccinium Andrenidae Andrena bradleyi Andrenidae Andrena carolina Apidae Habropoda laboriosa Megachilidae Osmia virga Melittidae Melitta americana Geraniaceae Geranium Andrenidae Andrena distans Lamiaceae Monarda Halictidae Dufourea monardae Liliaceae Erythronium Andrenidae Andrena erythronii Malvaceae Hibiscus Apidae Ptilothrix bombiformis Northeastern Naturalist Vol. 23, No. 2 J. Fowler 2016 311 number of specialist-bee species were Solidago (goldenrods), followed by Salix (willows), Symphyotrichum (American asters), and Vaccinium (blueberries) (11, 9, 6, and 6 bee species, respectively). I cataloged 6 families, 15 genera, and 61 species of northeastern native specialist bees. Life-history and taxonomic information about northeastern native specialist bees are presented in Supplemental Table 1 (available online at http:// www.eaglehill.us/NENAonline/suppl-files/n23-2-N1370-Reynolds-s1, and for BioOne subscribers, at http://dx.doi.org/10.1656/N1337.s1). The bee family with the most specialists in the Northeast was Andrenidae (38 spp.) and the bee genus with the most species was Andrena (mining bees) (32 spp.). Of the 61 bee species, 25 were common, 24 were uncommon, and 12 were rare. All bee species presented are solitary nesters, and none were known to be eusocial, although some might be communal (e.g., Perdita) or aggregate nesters (e.g., Colletes). Additionally, most cataloged bees were soil nesters, with the exception of 2 Megachilidae (leafcutter, mason, or resin bees), which likely nest in hollow/pithy stems or holes in wood. Overall numbers of specialist-bee species active per genus per month are presented in Figure 1. Specialist-bee adults were inactive during December, January, and February in the Northeast, remaining in their natal nests as pre-pupae or as adults in some early-spring–emerging species. Table 2, continued. Plant family Plant genus Bee family Bee scientific name Myrsinaceae Lysimachia Melittidae Macropis ciliata Melittidae Macropis nuda Melittidae Macropis patellata Onagraceae Oenothera Halictidae Lasioglossum oenotherae Megachilidae Megachile oenotherae Pontederiaceae Pontederia Apidae Melissodes apicata Halictidae Dufourea novaeangliae Portulacaeae Claytonia Andrenidae Andrena erigeniae Rhamnaceae Ceanothus Andrenidae Pseudopanurgus pauper Rosaceae Potentilla Andrenidae Panurginus potentillae Salicaceae Salix Andrenidae Andrena bisalicis Andrenidae Andrena clarkella Andrenidae Andrena erythrogaster Andrenidae Andrena frigida Andrenidae Andrena illinoiensis Andrenidae Andrena mariae Andrenidae Andrena nigrae Andrenidae Andrena salictaria Andrenidae Andrena sigmundi Saxifragaceae Heuchera Colletidae Colletes aestivalis Solanaceae Physalis Andrenidae Perdita halictoides Colletidae Colletes latitarsis Halictidae Lasioglossum pectinatum Verbenaceae Verbena Andrenidae Calliopsis nebraskensis Violaceae Viola Andrenidae Andrena violae Northeastern Naturalist 312 J. Fowler 2016 Vol. 23, No. 2 I documented associations with non-graminoid forbs and non-coniferous woody plants for all northeastern specialist-bee species and catalogued 201 species from 33 genera in 23 families of possible host-plants. Life-history and taxonomic information about northeastern native host-plants are presented in Supplemental Table 2, available online at https://www.eaglehill.us/NENAonline/ suppl-files/n23-2-N1370-Reynolds-s1, and for BioOne subscribers, at http:// dx.doi.org/10.1656/N1337.s1. The host-plant families with the greatest number of bee-assiciated species were Asteraceae, Ericaceae, Violaceae, Salicaceae, Brassicaceae, and Myrsinaceae (61, 24, 24, 22, 10, and 8 species, respectively). The host-plant genera with the greatest number of species were Solidago, Symphyotrichum, Viola (violets), Salix, and Vaccinium (24, 24, 24, 22, and 12 species, respectively). The proportional importance of host-plant and specialist-bee associations by 6 plant-groups is shown in Figure 2. I found clear associations with all 5 plant-habitat types for all northeastern specialist-bee species. The proportional importance of host plant and specialist-bee associations by plant habitats is shown in Figure 3. The most common host-plant– habitat description keywords (n = 273) were: “fields”, “roadsides”, “swamps”, and “woodlands” (56, 51, 36, and 32 descriptions, respectively). Discussion This manuscript presents the first catalog of specialist bees and associated hostplants for the northeastern US. Specialist bees, associated host plants, supporting Figure 1. Numbers of specialist-bee species active per family per month. Specialist-bee adults were inactive during December, January, and February in the Northeast. Northeastern Naturalist Vol. 23, No. 2 J. Fowler 2016 313 habitats, and future work will be discussed in the following paragraphs. I also provide recommendations based on my findings. Bees The distribution of pollen specialists among the bee families and genera of the Northeast is not random. Notably, the dominant and species-rich bee families Figure 2. Overall numbers of possible northeastern host-plant species (201 spp.) per plant group (D = herbaceous, flowering dicot = 136 spp., S = broad-leaved woody shrub = 54 spp., M = herbaceous, flowering monocot = 6 spp., T = broad-leaved woody tree = 2 spp., and ST = broad-leaved, woody shrub-tree = 3 spp.) per genus (33 genera), as multiplied by associated specialist bee richness (61 spp.). Figure 3. Overall numbers of possible northeastern host-plant species (201 spp.) per planthabitat (T = terrestrial = 103 spp., TW = terrestrial-wetlands = 71 spp., W = wetlands = 25 spp., A = aquatic = 1 spp., and AW = aquatic-wetlands = 1 spp.) per plant genus (33 genera), as multiplied by associated specialist-bee richness (61 spp.). Northeastern Naturalist 314 J. Fowler 2016 Vol. 23, No. 2 Halictidae (sweat bees) and Megachilidae are nearly devoid of oligoleges. Social Bombus (bumble bees; Apidae) have no pollen specialists, and oligoleges are similarly absent in the common masked-bee genus Hylaeus (Colletidae). Generalist bees of polyphagous and social groups are not restricted to certain pollen types, but have broad and clear preferences for flowers based on body size, shape, and tongue morphology (Cane and Sipes 2006, Robertson 1925). Several bee species not listed here deserve mention as to why they are not included. The squash bee Peponapis pruinosa (Say) (Apidae) is native to North America and is present in much of the Northeast (Hurd et al. 1971). This species is an oligolege of plants in the genus Curcurbita (cucumbers and squash), which only contains adventive species in the Northeast. However, Curcurbita pepo L. (pumpkins and squash) are extensively cultivated each year and the Squash Bee is established and common on farms and in home gardens. Squash Bees may well have been established in the region for centuries ever since squash and gourds were domesticated and widely planted by eastern Native American populations (Price 2009). Additional specialist-bee species have been recorded in states and regions that immediately border the Northeast. There have been few surveys for native bees to date, but it is likely that climate change will make the Northeast more hospitable for southern plants and associated bee species; thus, one might expect that Mid-Atlantic or southern bees will soon be recorded in the region (Breed et al. 2013). Bee species with host-plants that have range-shift potential include: Andrena rudbeckiae Robertson (Andrenidae) with Asteraceae; Cemolobus ipomoeae (Robertson) (Apidae) with Ipomoea spp. (morning glories); Melitoma taurea (Say) (Apidae) with Ipomoea; Paranthidium jugatorium (Say) (Megachilidae) with Asteraceae; and Melitta eickworti Snelling and Stage (Melittidae) with Vaccinium stamineum L. (Deerberry) (after Breed et al. 2012). Approximately 20% of 400 northeastern native bee species are cleptoparasitic (lay eggs in nests of other bees) and cannot be pollen specialists because they gather no pollen. However, some cleptoparasites associate with specialist bees and thus are indirectly dependent on the same plant groups as the specialist bees. The clearest example of this phenomenon occurs within the bee Family Melittidae, where all members of the 2 genera that occur in the Northeast are pollen specialists. None of the Melittid bees are common, and their 2 presumed nest-parasites—Epeoloides pilosula (Cresson) (Apidae) that parasitizes Macropis, and Nomada rodecki Mitchell (Apidae) that parasitizes Melitta—are extremely uncommon and of great conservation concern (Xerces Society 2016). Other specialist-bee Families are likely to have cleptoparasites, but because nesting biology of all northeastern bees is so understudied, specific nest-parasites cannot be confidently assigned t o specific hosts. Taxonomy and identification of the cleptoparasites is often difficult. Vulnerable or rare cleptoparasitic species may be associated with additional specialist bees outside of Melittidae, but information is limited. However, patterns exist at the generic level and, overall, I expect nest-parasites in the genus Nomada (cuckoo bees) inhabiting Andrena nests, Epeolus (cuckoo bees) exploiting Colletes (cellophane bees), Northeastern Naturalist Vol. 23, No. 2 J. Fowler 2016 315 and Triepeolus (cuckoo bees) parasitizing Melissodes (long-horned bees). Many of the bees listed in Supplemental Table 1 (available online at https://www.eaglehill.us/ NENAonline/suppl-files/n23-2-N1370-Reynolds-s1, and for BioOne subscribers, at http://dx.doi.org/10.1656/N1337.s1) are among the most uncommonly collected bee species in the Northeast. Thus, possible associations with pollen specialists might explain rarity of species within the cleptoparasitic genera Nomada, Epeolus, and Triepeolus. Plants Conservation and enhancement of native forbs, particularly goldenrods, asters, Helianthus (sunflowers), Euthamia (golden-tops), and Physalis (ground-cherries) are fundamental for maintaining and restoring plant–pollinator interactions in fields, meadows, roadsides, and waste areas. The maintenance of diverse heath shrub communities in acidic soils will benefit many bee species. Woodland hostplant restoration is essential because many specialist-bee species live only in rich deciduous forests and forage on spring ephemerals (e.g., Claytonia [spring beauties] and Erythronium [trout-lilies]), which are absent in fields. Moreover, I suggest that wetland restoration plantings should include Hibiscus (mallows), Lysimachia (loosestrifes), Pontedaria (pickerelweeds), Salix, and Ericaceous plants to provide forage for known and possible wetland oligoleges. Associations with non-graminoid and non-conifer plant-groups were clear for all northeastern specialist-bee species (Fig. 2). Forbs were the most important host-plant group, while shrubs were second. Of the 201 possible host-plants, only 3 species were classified as broad-leaved, woody shrub-tree—Ilex montana Torr. & Gray ex Gray (Mountain Holly), Ilex opaca Ait. (American Holly), and Salix pedicellaris Pursh (Bog Willow). Only 2 species were described as broad-leaved woody tree: Salix amygdaloides Anderss. (Peach-leaf Willow) and Salix nigra Marsh. (Black Willow). Of all 61 species of specialist bees, 9 bees were associated with 19 shrub, 1 shrub-tree, and 2 tree species of native Salix (Tables 1, 2; see also Supplemental Table 2, available online at https://www.eaglehill.us/NENAonline/ suppl-files/n23-2-N1370-Reynolds-s1, and for BioOne subscribers, at http:// dx.doi.org/10.1656/N1337.s1). Only 1 rare bee, Colletes banksi (Swenk), was associated with 4 shrub and 2 shrub-tree species of native Ilex. Thus, broad-leaved woody trees were proportionally more important than broad-leaved, woody shrubtrees for overall host-plant and specialist-bee associations. Non-native plants should be avoided or counter-balanced in conservation plans by conservation and propagation of northeastern native host-plants. Native hostplants are often absent from standard northeastern planting mixes, which may increase generalist-bee abundance, but might not augment specialist-bee biodiversity. While I would not recommend eliminating highly attractive and productive non-native species from plantings, they should not be dominant. Of the 201 species of host-plants listed in this study, 102 were native in all 6 states and 4 were introduced in a total of 3 states: Ceanothus herbaceus L. (Rhamnaceae; Prairie Redroot) is native in VT, but introduced in MA; Ilex opaca Ait. (Aquifoliaceae; American Northeastern Naturalist 316 J. Fowler 2016 Vol. 23, No. 2 Holly) is native in MA and RI, but introduced in CT; Krigia biflora Walt. (Asteraceae; Two-flowered Dwarf-dandelion) is native in CT, but introduced in ME; and Physalis virginiana P. Mill. (Solanaceae; Virginia Ground-cherry) is native in CT, but introduced in MA, ME, and NH. Such marginally native host-plants should be carefully considered for propagation outside their indigenous ranges. The findings presented here show that native-plant propagators should add diverse specialist-bee host-plants to nursery stock and seed banks. Although a number of these plants are available from retail nurseries and seed distributors, many ecotypes of host-plant genera or species remain uncultivated. Accordingly, opportunities are present for northeastern plant propagators to diversify plant selections for ecological, social, and economic sustainability. Habitats All northeastern habitats, with the exception of closed-canopy conifer stands, can support specialist bees if associated native plant communities are conserved or enhanced. The second- and third-most important host-plant habitats were terrestrial– wetland ecotones and wetlands. I identified clear associations between plants found in wetland habitats and many specialist-bee species (Fig. 3). For example, of all 201 possible host-plants, only 1 species was characterized as aquatic (Pontederia cordata L. [Pickerelweed]) and only 1 was characterized as an aquatic-wetland species (Cardamine pennsylvanica Muhl. ex Willd. [Pennsylvania Bittercress]). Of the 61 species of northeastern specialist bees, 2, Dufourea novaeangliae (Robertson) (Pickerelweed Sweat Bee) and Melissodes apicata Lovell and Cockerell (Pickerelweed Long-horned Sweat Bee), associated only with P. cordata, and Andrena arabis Robertson (Rockcress Mining Bee) associated with 1 species of terrestrial Arabis (rockcress) and 9 species of mixed aquatic wetlands, terrestrial, terrestrial wetlands, and wetlands Cardamine (bittercress) (Tables 1, 2; see also Supplemental Table 2. available online at https://www.eaglehill.us/NENAonline/suppl-files/n23- 2-N1370-Reynolds-s1, and for BioOne subscribers, at http://dx.doi.org/10.1656/ N1337.s1). Thus, aquatic habitat was proportionally more important than aquaticwetlands ecotone habitat for overall host-plant and specialist-bee associations. Two northeastern bee species are associated with, if not restricted to, wetland habitats: Hylaeus nelumbonis (Robertson) (Lotus Masked Bee) and Lasioglossum nelumbonis (Robertson) (Lotus Sweat Bee). The only other regional bees locally restricted to a physical landform rather than to a plant group are those occurring in dunes and deep-sand environments. However, unlike the sand-loving bees, these 2 wetland species are not restricted to wetlands by possible nesting requirements. Wetland soils are inappropriate for all regional soil-nesting Lasioglossum species, and stem-nesters such as Hylaeus require only that suitable nesting plants are present, irrespective of the habitat. Correspondingly, these species might require a set of preferred wetland plants. While both bee species have traditionally been associated with Nymphaea (water-lilies), H. nelumbonis and L. nelumbonis have been noted foraging for nectar and pollen on a wide variety of other plants near wetlands (M. Arduser, Missouri Department of Conservation, Jefferson City, MO, pers. comm.). Northeastern Naturalist Vol. 23, No. 2 J. Fowler 2016 317 Future work Given the disorganized and sparse data on pollen preferences of bees, the difficulty in determining whether bees collected on flowers are provisioning their nests with pollen from that flower or are simply collecting nectar, and that non-provisioning male bees are included in floral records, strict and quantifiable measurements of specialization are currently impossible. 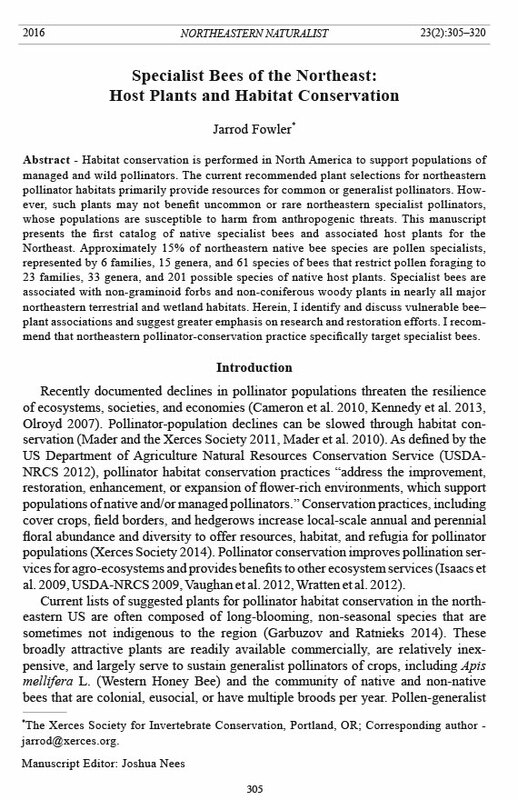 However, because the purpose of this paper is not to provide a precise quantification of such associations, but to outline a basis for expanding recommended plant lists for pollinator conservation, the patterns of specialization, even from disorganized and sparse data, are usually clear. Connecticut and Massachusetts had the most records of specialist-bee species in the region (56 and 54 species, respectively). Of the 61 species of specialist bees, 17 species have been collected in all 6 northeastern states, while 7 species were collected only in CT and MA and 7 species were collected in CT, MA, ME, NH, and RI. Six species were collected only in CT, MA, and NH, and the remaining 24 species were collected throughout and within the 6 states. Thus, additional collections are recommended in ME, NH, and RI. Although the records upon which this study is based might be considered incomplete, any quantitative definition of host-plants for bees will be partially incomplete given the broad and imprecise range of available source information on spatiotemporal pollen-gathering activities. Available sources almost never provide complete, consistent, or rigorously quantitative data or details for each bee species. However, the combination of data from published literature, information from museum collections, my direct field experience, and vetting this catalog with experts in the field supports the validity of my qualitative identifications of these primary associations at the genus level. If this publication stimulates subsequent investigations and clarifications, then it will be a success. There is an information gap in our understanding of the status and distribution of bee-associated plant populations in the Northeast, shown by contrasting the myriad published floras for the region with only 2 published bee faunas (Proctor 1946, Viereck 1916). Species-level patterns of specialization should be clarified by future collections and research. Degrees and patterns of pollen use by northeastern species are undoubtedly more complicated and nuanced than presented here. For example, specialist bees listed here may forage on alternate pollens at range edges or during resource dearth; specialists might restrict pollen foraging to limited plant species within documented genera; and specialists may be so understudied that some bees likely have failed to be listed and some, perhaps, should be delisted. Consequently, there is still much to learn about both the distribution of specialist bees in the Northeast as well as their pollen-gathering preferences. Acknowledgments Thanks to Sam W. Droege (United States Geological Survey, Bee Inverntory and Monitoring Lab), Michael S. Arduser (formerly with the Missouri Department of Conservation), John S. Ascher (National University of Singapore), Daniel P. Cariveau (University of Minnesota), Charles S. (Charley) Eiseman (freelance naturalist), Jason Gibbs (Michigan State Northeastern Naturalist 318 J. Fowler 2016 Vol. 23, No. 2 University), Robert P. Jean (Saint Mary-of-the-Woods College), John L. (Jack) Neff (Central Texas Melittological Institute), T'ai H. Roulston (University of Virginia), and Kimberly A. Stoner (Connecticut Agricultural Experiment Station) for comments. J. Fowler greatly appreciates the efforts of the Discover Life and Go Botany groups to compile distribution and natural history information for bees and plants. Literature Cited Ascher, J.S., and J. Pickering. 2014. Discover Life species guide and world checklist (Hymenoptera: Apoidea: Anthophila). Available online at http://www.discoverlife.org/ mp/20q?guide=Apoidea_species. Accessed 15 January 2015. Bartomeus, I., J.S. Ascher, J. Gibbs, B.N. Danforth, D.L. Wagner, S.M. Hedtke, and R. Winfree. 2013. Historical changes in northeastern US bee pollinators related to shared ecological traits. Proceedings of the National Academy of Sciences of the United States of America 110(12):4656–4660. Behmer, S.T., and W.D. Nes. 2003. Insect sterol nutrition and physiology: A global overview. Advances in Insect Physiology 31:1–72. Breed, G.A., E.E. Crone, and S. Stichter. 2013. Climate-driven changes in northeastern US butterfly communities. Nature Climate Change 3(2):142–145. Cameron, S.A., J.D Lozier, J.P. Strange, J.B. Koch, N. Cordes, L.F. Solter, and T.L. Griswold. 2011. Patterns of widespread decline in North American bumble bees. Proceedings of the National Academy of Sciences of the United States of America 108(2):662–667. Cane, J.H., and S. Sipes. 2006. Floral specialization by bees: Analytical methodologies and a revised lexicon for oligolecty. Pp. 99–122, In N. Waser and J. Ollerton (Eds.). Plant- Pollinator Interactions: From Specialization to Generalization. University of Chicago Press, Chicago, IL. 488 pp. Garbuzov, M., and F.L.W. Ratneiks. 2014. Listmania: The strengths and weaknesses of lists of garden plants to help pollinators. BioScience 64:1019. Gavier-Pizarro, G.I., V.C. Radeloff, S.I. Stewart, C.D. Huebner, and N.S. Kueler. 2010. Housing is positively associated with invasive exotic plant species richness in New England, USA. Ecological Applications 20(7):1913–1925. Griffith, G.E., J.M. Omernik, S.A. Bryce, J. Royte, W.D. Hoar, J.W. Homer, D. Keirstead, K.J. Metzler, and G. Hellyer. 2009. Ecoregions of New England: Color poster with map, descriptive text, summary tables, and photographs. US Geological Survey, Reston, VA. Haines, A., E. Farnsworth, G. Morrison, and New England Wild Flower Society. 2011. New England Wild Flower Society’s Flora Novae Angliae: A Manual for the Identification of Native and Naturalized Higher Vascular Plants of New England. Yale University Press, New Haven, CT. 1008 pp. Hilty, J.A. 2012. Oligolectic Bees. Available online at http://www.illinoiswildflowers.info/ flower_insects/files/oligoleges.htm. Accessed 15 January 2015. Hurd, P.D., Jr., E.G. Linsley, and T.W. Whitaker. 1971. Squash and gourd bees (Peponapis, Xenoglossa) and the origin of the cultivated Cucurbita. Evolution 25:218–234. Hurd, P.D., Jr., W.E. LeBerge, and E.G. Linsley. 1980. Principal Sunflower Bees of North America with Emphasis on the Southwestern United States (Hymenoptera, Apoidea). Smithsonian Institution Press, Washington, DC. 158 pp. Isaacs, R., J.K. Tuell, A.K. Fiedler, M. Gardiner, and D. Landis. 2009. Maximizing arthropod- mediated ecosystem services in agricultural landscapes: The role of native plants. Frontiers in Ecology and the Environment 7:196–203. Kartesz, J.T., and The Biota of North America Program (BONAP). 2013. North American Plant Atlas. Available online at http://bonap.net/napa. Accessed 15 January 2015. Northeastern Naturalist Vol. 23, No. 2 J. Fowler 2016 319 Kennedy, C.M., et al. 2013. A global quantitative synthesis of local and landscape effects on native bee pollinators in agroecosystems. Ecology Letters 16:584–599. Kleijn, D., et al. 2015. Delivery of crop-pollination services is an insufficient argument for wild pollinator conservation. Nature Communications 6:7414. Linsley, E.G., and J.W. MacSwain. 1958. The significance of floral constancy among bees of the genus Diadasia (Hymenoptera, Anthophoridae). Evolution 12:219–223. Lovell, J.H. 1918. The Flower and the Bee: Plant Life and Pollination. Charles Scribner’s Sons, New York, NY. 286 pp. Mader, E., and The Xerces Society for Invertebrate Conservation. 2011. Attracting Native Pollinators: Protecting North America's Bees and Butterflies: The Xerces Society Guide. Storey Publications, North Adams, MA. 384 pp. Mader, E., M. Spivak, E. Evans, and Natural Resource, Agriculture, and Engineering Service. 2010. Managing Alternative Pollinators: A Handbook for Beekeepers, Growers, and Conservationists. Sustainable Agriculture Research and Education. Beltsville, MD. 162 pp. Minckley, R.L., W.T. Wcislo, D. Yanega, and S.L. Buchmann. 1994. Behavior and phenology of a specialist bee (Dieunomia) and sunflower (Helianthus) pollen. Ecology 75:1406–1419. Mitchell, T.B. 1960. Bees of the Eastern United States, Volume I. North Carolina Agricultural Experiment Station, Raleigh, NC. 524 pp. Mitchell, T.B. 1962. Bees of the Eastern United States, Volume II. North Carolina Agricultural Experiment Station, Raleigh, NC. 558 pp. New England Wild Flower Society. 2015a. State of the plants: Challenges and opportunities for conserving New England’s native flora. New England Wild Flower Society, Framingham, MA. 73 pp. New England Wild Flower Society. 2015b. Go botany [2.2]. Available online at http:// gobotany.newenglandwild.org. Accessed 15 January 2015. Olroyd, B.P. 2007. What’s killing American honey bees? PLoS Biol 5:168. Omernik, J.M. 1987. Ecoregions of the conterminous United States (map supplement). Annals of the Association of American Geographers 77:118–125. Omernik, J.M. 2004. Perspectives on the nature and definition of ecological regions. Environmental Management 34.1:S27–S38. Praz, C.J., A. Mueller, and S. Dorn, 2008. Specialized bees fail to develop on non-host pollen: Do plants chemically protect their pollen? Ecology 89:795–804. Price, T.D. 2009. Ancient farming in eastern North America. Proceedings of the National Academy of Sciences of the United States of America, 106(16):6427–6428. Procter, W. 1946. Biological Survey of the Mount Desert Region, Part VII, The Insect Fauna Wistar Institute, Philadelphia, PA. 566 pp. Radeloff, V.C., R.B. Hammer, S.I. Stewart, J.S. Fried, S.S. Holcomb, and J.F. McKeefry. 2005. The wildland–urban interface in the United States. Ecological Applications 15:799–805. Rafferty, N.E., P.J. CaraDonna, and J.L. Bronstein. 2015. Phenological shifts and the fate of mutualisms. Oikos 124:14–21. Robertson, C. 1925. Heterotropic bees. Ecology 6:412–436. Robertson, C. 1926. Revised list of oligolectic bees. Ecology 7:378–380. Robertson, C. 1929. Phenology of oligolectic bees and favorite flowers. Psyche 36:112–118. Roulston, T.H., and J.H. Cane. 2000. Pollen nutritional content and digestibility for animals. Plant Systematics and Evolution/Entwicklungsgeschichte und Systematik der Pflanzen 222(1):187–209. Northeastern Naturalist 320 J. Fowler 2016 Vol. 23, No. 2 Roulston, T.H., J.H. Cane, and S.L. Buchmann. 2000. What governs protein content of pollen: Pollinator preferences, pollen–pistil interactions, or phylogeny? Ecological Monographs 70(4):617–644. Senapathi, D., J.C. Biesmeijer, T.D. Breeze, D. Kleijn, S.G. Potts, L.G. Carvalheiro. 2015. Pollinator conservation: The difference between managing for pollination services and preserving pollinator diversity. Current Opinion in Insect Science 12:93–101. US Department of Agriculture–Natural Resources Conservation Service (USDA–NRCS). 2009. Pollinator biology and habitat: New England pollinator handbook. Available online at http://www.nrcs.usda.gov/Internet/FSE_DOCUMENTS/nrcs142p2_010204.pdf . Accessed 15 January 2015. USDA–NRCS. 2012. Pollinator habitat enhancement plan, practice activity code (No. 146) Available online at http://efotg.sc.egov.usda.gov/references/public/MA/146_PollinatorHabitat_ CAP_CriteriaDec1212.pdf. Accessed 15 January 2015. USDA–NRCS. 2014. Pollinator-friendly plants for the northeast United States. Available online at http://www.nrcs.usda.gov/Internet/FSE_DOCUMENTS/nrcs144p2_027028. pdf. Accessed 15 January 2015. Vaughan, M., E. Mader, J. Guisse, J. Goldenetz-Dollar, and B. Borders. 2012. Conservation cover (327) for pollinators: New England installation guide and job sheet. The Xerces Society for Invertebrate Conservation, Portland, OR. Available online at http://www. xerces.org/wp-content/uploads/2013/01/InstallGuideJobSheet_NewEngland_CnsrvCvr. pdf. Accessed 15 January 2015. Viereck, H.L. 1916. Apoidea. The Hymenoptera or, wasp-like insects, of Connecticut. State of Connecticut Geological and Natural History Survey Bulletin No. 22:1–824. Wratten, S.D., M. Gillespie, A. Decourtye, E. Mader, and N. Desneux. 2012. Pollinatorhabitat enhancement: Benefits to other ecosystem services. Agriculture, Ecosystems, and Environment 159:112–122. Xerces Society for Invertebrate Conservation (Xerces Society). 2014. Farming with Native Beneficial Insects: Ecological Pest Control Solutions. Storey Publications, North Adams, MA. 272 pp. Xerces Society. 2016. Red list of bees: Native bees in decline. Available online at http:// www.xerces.org/pollinator-redlist/. Accessed 13 May 2016.